Does Clothing Require a Label? Which Regulatory Bodies Oversee Garment Labeling? Are There Fines for Failing to Follow These Regulations? Are There Different Labeling Requirements Clothes for Adults and Children? When you are designing and producing clothing, the positioning of the garment label is an important aspect of the production process. This element is identified in our How To Make a Tech Pack article, and it is a major part of the overall specifications during production. However, it’s not just where the label is placed on your clothing that is important. The information that the label contains, such as care labeling and flammability information, is also significant. Garment labeling isn’t new in clothing production, but it is something to consider. It's important to ensure that you adhere to local regulations and laws such as those handed down by the Federal Trade Commission (FTC), and this simple guide will help you identify the information that is required. In addition, we'll inform you about some other details that you should include to improve your customer service. In short, yes. Not only does a label establish your clothing and brand identity, but it also gives instructions that help the customer best care for the garment long after purchase. Clothing labeling is so important, in fact, that consumer protection agencies in the United States, Canada, and abroad have stringent care labeling requirements. In addition, certain independent organizations, such as the International Organization for Standardization (ISO), have their own labeling requirements that companies must follow if they wish to receive certification. While the garment label requirements of different countries are similar in that these regulations are all in place for consumer protection purposes, there are some important differences between these requirements that you'll need to know about if you want to sell clothing or household textile items internationally. A simple tag on the inside center area of a garment reading "Made in the USA" simply won't cut it, but we'll help you navigate the complex legal framework surrounding garment care information labeling to help you transform your company name into a household name all across the globe. In the United States, the FTC and the U.S. Customs and Border Protection (CPB) oversee the labeling requirements for textile and apparel products. The FTC ultimately handles the administration of care labeling rules in this country, but the CPB handles the control and inspection of textile products entering the United States from other countries. In the UK, the Department for Business, Energy & Industrial Strategy has been tasked with developing and enforcing this country's textile labeling regulations. In some situations, however, enforcement of these rules may be left to local law enforcement bodies. In the EU, textile and clothing labeling is overseen by the European Commission, but member nations may have their own additional labeling requirements. Australia's clothing and textile regulations are overseen by Product Safety Australia (PSA), which is part of the Australian Competition & Consumer Commission (ACCC). In New Zealand, garment labeling is overseen by the Commerce Commission. In compliance with the Wool Products Labeling Act and the Textile Fiber Products Identification Act, which are collectively known as the Textile and Wool Acts, all garments sold in the United States must feature clear labeling regarding their fiber contents. These contents must be listed in descending order in terms of percentage, and it is not necessary to list non-fibrous materials in this list. All fibers included in the garment that have functional significance must be listed, but non-functional fibers need not be listed if their concentrations in the final garment are under 5 percent each. Instead, these fibers can be declared together as a total percentage under the heading "other fibers." In addition, decorative items, such as braids and belts, do not need to be listed if they comprise less than 15 percent of the garment. If ornamentation on a textile product does not exceed 5 percent of its total composition, it can be omitted, but the phrase "Exclusive of Ornamentation" should be listed at the bottom of the label. Linings should be labeled separately, and all textile materials should be listed under their generic names instead of their trade names. The FTC requires that all clothing labels disclose the country where the clothing was created. A textile product can only be labeled "Made in USA" if it was manufactured in the USA and it is made from materials that were manufactured in the United States. If a garment was made in the United States from materials that were created in a different country, its label must state "Made in the USA of Imported Materials." The FTC enforces the Care Labeling Rule, which requires all textile manufacturers selling products in the United States to provide labels that inform consumers regarding the best ways to care for their products. For instance, care practices that could harm the garment must be disclosed, and suggested washing temperatures are also required. These labels must be clear, legible, and designed to last the life of the garment. This aspect of the FTC's garment labeling codes also helps you market your brand. A garment label on a textile product sold in the USA must feature the registered identification number (RN) of the manufacturer, importer, or corporate entity handling the sale of the product. All domestic textile companies and importers are required to have RNs. This number establishes dealer identity, and you can further reinforce your brand identity by including the name of the manufacturer on your garment label. It's possible to include all of the FTC's required information on one label, or this information can be split onto separate labels. These labels must remain attached to the garment until it reaches the consumer, which means that this FTC-required information cannot be included on hang tags. If a garment has a neck, country of origin information must be located on the inside center of the neck, and other labels must be placed in easily noticed locations. As part of the Government’s Textile Labelling Regulations, fiber content should be clearly displayed on your label. To showcase this, you will need to include the main fiber content of your garment in percentages. For example, "100% cotton." The regulations that cover fiber content explain definitions of certain materials and using expressions such as "pure" or "100%" etc. 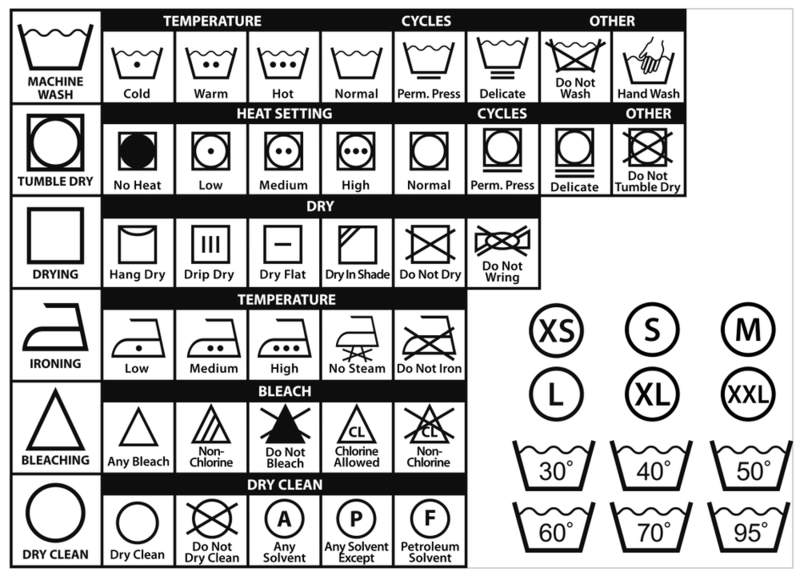 There is also information on common descriptions and how to determine garment composition. You will also have to consider suitable labeling if you are selling to other locations outside of the UK as there will be different regulations and labeling regulations to adhere to. For more information on fiber content, take a look at Guidance on Textile Products (Labelling and Fibre Composition) Regulations. This information is not compulsory in garment production in the UK. However, as part of trading regulations, it is essential to state the country the product was made. This is required so that brands don’t mislead customers about where the item was created. For example, if your clothing is designed in the UK but manufactured in China, "Made in China" has to be clearly displayed. Care instructions are not a mandatory feature of clothing labels in the UK, but they are highly recommended to assist the customer in prolonging the life of the garment. Most manufacturers provide care and washing instructions on clothing during the production process as a standard operating procedure. You can work with your supplier to make sure the information is beneficial and clear to your audience. Further information on care labels can be found here. If you are producing specific types of garments such as children’s clothing, baby clothing, and nightwear, your clothing label has to display wording that states you meet BS-5722, which is the British Standard for flammability. If clothing does not meet these standards, you have to state on the label, "KEEP AWAY FROM FIRE." This wording does carry some specific font and character requirements to ensure it can be read clearly. It must be in bold and red Arial font and in at least size 10pt in capital letters. This is a labeling requirement that should always be adhered to as any failure to follow this requirement can have severe consequences for consumers if they are not fully informed. If you need further information, take a look at flammability standards and The Nightwear (Safety) Regulations 1985 here. The position of your label should be clearly specified when you complete your tech pack. Most clothing manufacturers will place a label on the inside seam of the garment for ease. This way it is easy to find but hidden from the outside. The amount of information you need to include will determine the length of the label. Placement of the label should be worked into the design and discussed with your clothing manufacturer to ensure all information is clearly displayed. Branding is a significant factor in clothing production, and something as simple as a small label can make a world of difference. Many consumers get asked "where was that from?" or "what size did you get?" when talking to others, and the label is the first place they look especially if they’ve had the garment for several years. As you don’t have a lot of space, a logo will suffice. This can usually be included on the top or bottom of the little satin label that is woven into the side of your garment. This also complements the main inside neck branding and size information. For brands that have special certifications or awards, this information can be displayed on the garment label. Specifics such as sustainable production or organic fiber content can also be shown here. The fiber content of textile products sold within the European Union must be clearly labeled in an accessible area. The label containing this information must be securely attached and durable, and this information should not include abbreviations aside from internationally standardized mechanized processing codes. Only textile products that are composed exclusively of one fiber can be labeled as "100 percent," and decorative fibers present in concentrations of less than 7 percent need not be labeled. Additionally, it is not necessary to label antistatic substances that are present in concentrations of less than 2 percent, but any non-textile components of animal origin must be marked. Legislation regarding declaration of country of origin is not harmonized within the EU. Certain member nations may require this type of labeling, but others may not. Care labeling is not required under EU law, but certain member countries, such as Austria, may require this labeling. However, the EU may find manufacturers liable for defective products under the Product Liability Directive of 1985 if they do not provide this information, so including care labeling with textile products sold in the European Union is highly recommended. Manufacturer identification is not required under EU law. However, you are strongly advised to include your branding information with items sold in the European Union to improve your brand exposure. Legislation regarding specific label placement is not harmonized within the EU. However, exporters to this bloc should be aware of the importance of the European "Ecolabel," which is available for both food and natural textile products. To receive an Ecolabel, manufacturers must request certification from the European Ecolabeling Board. In addition, it's important to keep in mind that the EU has highly stringent requirements for the safety of textile products, and if your products are not in line with these requirements, they will not be allowed inside the European Union. Australia no longer mandates fiber content labeling. This type of labeling was required up until 2010, but it lapsed in 2011 when the Australian Consumer Law was passed. Nevertheless, it's still considered to be the best practice in this country to clearly declare the percentage of each fiber in descending order. It is, however, important to point out that the Australian state of New South Wales (NSW) still has fiber content labeling laws. It is necessary to comply with these laws to sell textile products in this state. Different labeling requirements are mandated for items that are made wholly in Australia, partially in Australia, or wholly imported. These requirements are detailed in Competition and Consumer Act 2010, Commerce Act 1905, and Customs Act 1901. Manufacturer identification labeling is not explicitly required in Australia. However, it is important to properly brand your products if you want to increase your brand exposure. Australian law used to require clothing to follow strict size standardization requirements. However, this legislation was withdrawn in 2009. Labeling legislation varies from country to country, and each nation has imposed its own penalties for failures to comply with these laws. In the United States, there are no set fines for failure to comply with labeling laws, but the FTC has been known to go after textile companies with full force when they fail to properly label their products. For instance, this regulatory body slapped both Tommy Hilfiger and Jones Apparel with $300,000 fines when these companies failed to provide proper labeling, and other companies, such as Mohl Fur Company, have paid out similarly steep fines for failing to disclose the countries of origin of their products. Regulatory bodies in other nations are equally likely to prosecute any failures to comply with their labeling laws, so strict adherence to the relevant legislation is highly recommended. The United States applies the same labeling requirements for apparel for adults and children. While the EU has very strict safety requirements for textile products that are made for children, it has the same labeling requirements for both consumer populations. The UK applies flammability labeling requirements to certain types of childrenswear, but Australia does not differentiate between labeling requirements for adults and children. Garment factories often have set labeling practices for garments. However, you can work with your chosen manufacturing partner to design your label for your brand. This process is simple, and with expert help, you will adhere to local and international regulations with ease.